1. Using the round disk as a guide, trim the pink paper to fit the disk. Apply a coat of Mod Podge to the base of the disk and to the back of the paper. Place the paper on the disk and press out any air bubbles. 2. Use the circle punch to create small circles from the black paper. Apply a small amount of glue to the pack of the circles and position in a random pattern on the pink-papered disk. 3. Hot glue the chipboard letters to the papered disk. Add a few rhinestones. 4. Create a hanger by hot gluing a strip of trim (in a u-shape) to the back of the disk. Add fluff to the door décor by hot gluing trims around the disk. 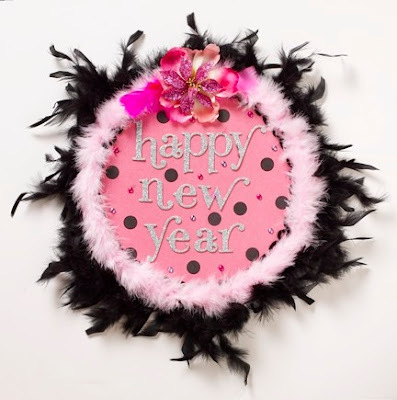 Add a flower pop, by gluing a few feathers and a glittery flower to the top center. I wish I had the supplies on hand right now to make this and hang on my door tonight, it's so awesome! I love this! It's super cute.